The CLEAN & CLEAR Cartridge Filter features a thermoplastic chemical resistant tank with no-tool servicing and a coreless cartridge for easier cleaning. All models are equipped with easy spin-on unions for plumbing hook-ups. These filters are NSF listed for commercial applications and are available in 50, 75, 100, 150, and 200 square foot sizes. A Answered on 8/25/2018 by InyoPools Product Specialist Lennox H.
Hi, Trevor. Yes, this filter will be great for a 9700 gallon pool if the pump has a flow rate under 50 GPM. how to clean the filter and how often to clean the filter? Thank you. A Answered on 11/7/2017 by InyoPools Product Specialist Lennox H.
A Answered on 10/24/2016 by InyoPools Product Specialist Stacey M.
Hello, You can send any pictures to upload@inyopools.com of your pump. A Answered on 10/12/2016 by InyoPools Product Specialist Lennox H.
Hi. 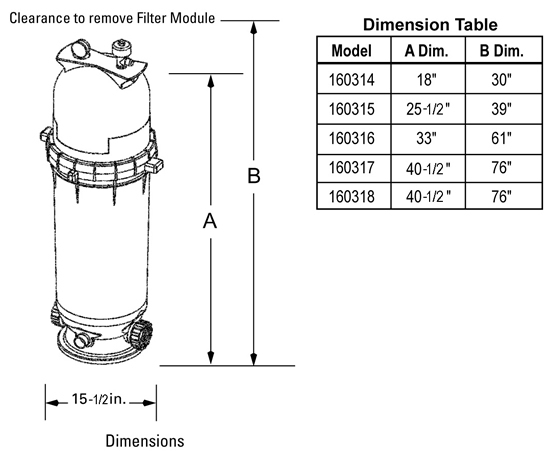 This filter will provide adequate filtration if the flow rate of you pump does not exceed 50 gpm. We have several Inground Pool Salt Systems that can be used to chlorinate your pool depending on capacity and initial cost, the Hayward Aqua Rite - AQR3 would be my recommendation. I have a kidney shape pool which is A = 13', B = 13', C = 29'. I have a Hayward Super Pump SP2610X15 1-1/2-Horse-Power Pool Pump. What type of cartridge filter would work best? The pump is 8' above and 50' away from the inground pool. A Answered on 6/19/2016 by InyoPools Product Specialist Lennox H.
Hi Stephen, I would recommend either the 160317 or 160318 for maximum efficiency and longevity. What gasket do I need for the Pentair Clean & Clear filter 160314? A Answered on 3/28/2016 by InyoPools Product Specialist Lennox H.
Hi Bill, The Body/Tank O-ring will be the most common o-ring. You can also locate other replacement parts via the Pentair Clean & Clear/Predator Parts. I think I installed the locking ring correctly, but the filter still leaks when pool pump is on. How can I correct the issue? Hi Bill, That's an indicator that the Body/Tank O-ring needs to be replaced. A Answered on 7/29/2015 by InyoPools Product Specialist Hector F.
We would need the pump/motor model and the distance the equipment is from the pool in order to make sure that the filter we recommend is compatible, based off the gallons per minute rating with your pump. A Answered on 6/27/2015 by InyoPools Product Specialist Hector F.
For your sized pool with the approximate water pressure rating that you have, I would start at the least with a 200 sq. ft. Pentair Clean and Clear filter that you can view here. You may have other factors to be reviewed regarding your system so you may want to confirm with us by providing us with whether you have a solar heating system as well via phone call or get with a licensed pool contractor. Generally speaking though, this is where you would want to begin. A Answered on 5/10/2015 by InyoPools Product Specialist Andy O.
Howard- The Clean and Clear 50 Sq. Ft. Filter 160314 will work for a 16k gallon pool. In 8 hours it can turnover 24k gallons. You would have to make sure you pump isn't too strong for it because it only has a 50 gpm maximum flow rating. Are there specs on how many microns this filter is rated at? Is there available another filter that won't allow finer particles to pass through? A Answered on 10/1/2014 by InyoPools Product Specialist Patrick P.
As a rule, sand filters sift particles ranging from 20 to 40 microns in size. Cartridge filters can sift particles as small as 10 to 20 microns in size. DE filters can sift contaminants as small as 1 to 3 microns in size. This makes DE filtration at least five to six times more efficient than sand filtration systems. Does this come with the filter cartridge and gauges? A Answered on 9/21/2006 by InyoPools Product Specialist Patrick P.
This filter comes direct from the manufacturer and includes the cartridge and gauges.